Think Cajun. Our January Burger of the Month is all about that special Cajun style seasoning. Check out our Fire Bird burger which has our Grilled Cajun Chicken Breast topped with Bacon, Avocado and Pepperjack Cheese. It’s a fiery feast in one! When you think Cajun, the first thing that comes into mind are the spices in every bite of food you take. Why not live a little and add more spice to your life? Add our Kilauea Fire Sauce for extra zing. It may be hot, but that’s what the Fire Bird is all about – keeping the flame. Too hot for you? Not a problem, putting out the flame will be as easy as 1-2-3. Instead of our normal Shake of the Month, we’d love for you to get your hands on our Ice Cream Floats. Combine your favorite ice cream and soda. The options are endless – at least at our fountain! Cool down! 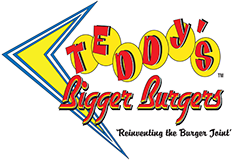 Happy New Year from all of us at Teddy’s Bigger Burgers!